Chance the Rapper's life couldn't be more blessed right now. His mixtape Coloring Book has propelled him to the upper echelons of the hip hop world, and he even got a chance to remix the classic Kit Kat jingle. But there's not much else we know about Chancellor Bennett (what a dope name), because he keeps his personal life to himself, using his social media mostly for promos. 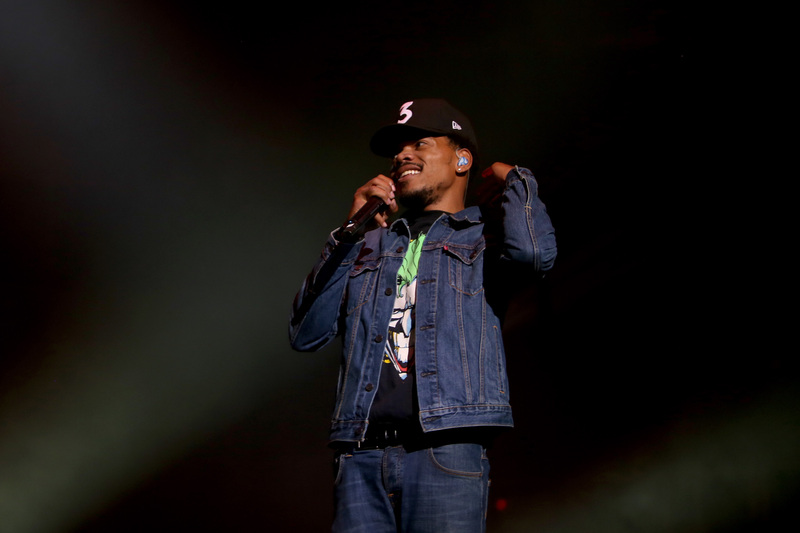 But the world wants to know: Does Chance the Rapper have a girlfriend? He does, and he knows he's blessed. The 23-year-old rapper has been with his girlfriend, Kirsten Corley, since 2013, a source told Billboard. Their relationship has been extremely private — good on them; sad for fans — but recently Chance let up a little bit. You probably caught a glimpse of Corley in Chance's #SoGoneChallenge. Chance posted an adorable and adoring freestyle verse for the challenge on Twitter and the video soon after went viral. "I got the baddest chick on the planet," he raps. He also says that he, "rubs her feet and puts in work like Robyn Fenty" and that "The only chick I hold as much is probably Kinsley." Kinsley being the baby that Chance and Corley welcomed last year. The couple welcomed Kinsley last September, and Chance broke the news of the pregnancy in the sweetest way: with an Instagram of his hand on Corley's baby bump captioned "Coming soon." After Kinsley was born, Chance sadly didn't post any baby pics, but he did post a message of gratitude in the caption of a photo of his "parent" bracelet from the hospital. He wrote, "I love this time in my life and I've learned to love better because of it." It seems like Chance and Corley don't have plans to get married any time soon, but it looks like Chance wants to change that. He raps about Corley and baby Kinsley on "All We Got," the first track on Coloring Book: "Tryna turn my baby mama to my fiancée / She like music, she from Houston like Auntie Yoncé / Man my daughter couldn't have a better mother / If she ever find another, he better love her." I hope she never finds another and they stay together forever, TBH. In an interview with GQ in August, Chance said he was feeling lost before he and Corley had the baby, and that Kinsley "brought [his] faith back" (he's Christian, and raps about Jesus quite often). He also revealed that Coloring Book was mixed in basically two months, and that he slept in the studio most nights with Corley and the baby there with him. So cute. More like Chance the Sappy, am I right?